Interactive Evolutionary Computation (IEC) systems often suffer from users only performing a small number of generations, a phenomenon known as user fatigue. This is one of the main hindrances to these systems generating complex and aesthetically pleasing pieces of art. 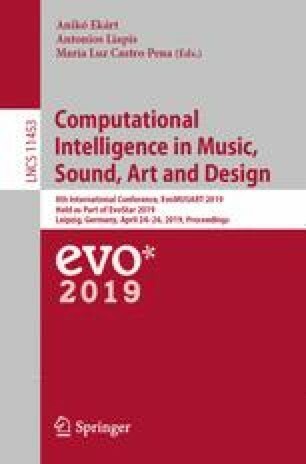 This paper presents two novel approaches to addressing the issue by improving user engagement, firstly through using Virtual Environments and secondly improving the predictability of the generated images using a well-defined structure and giving the user more control. To establish their efficacy, the concepts are applied to a series of prototype systems. Our results show that the approaches are effective to some degree. We propose alterations to further improve their implementation in future systems.